Myth 1: Stretching before a workout is important to prevent injury. Fact: Stretching before a workout doesn't increase your range of motion. Some studies suggest that it can destabilize the muscles and make you less prepared for a vigorous workout, especially something like weight lifting. Instead, a quick warm up like a run on a treadmill or a cross-trainer can get your blood pumping. Myth 2: If you don't have sore muscles the next day, then your workout was not enough. Fact: Do not make muscle soreness a yardstick to measure the progress of your goal. Soreness is the inflammation and a chemical response of stressed muscles that heal on their own. You don't have to have soreness to lose weight or build muscles. Myth 3: If you don't sweat, you are not exercising enough. Fact: Heart rate is the best measure of your exercise routine and not sweating. Sweat just regulates body temperature and some of us just sweat more than others. Myth 4: Machines are safer than free weights. Fact: Not necessarily. Machines may not suit all body types. And some machines might not suit particular medical conditions. Free weights on the other hand can be adapted easily. Your trainer is the right person to judge what suits you best - free weights or machines. Myth 5: You can get rid of belly fat with abdominal crunches. Fact: If you have a high body fat percentage, your abs will be covered with layers of fat. In order to get visibly toned abs, one must first lose overall body fat with an exercise routine that is coupled with cardio and strength training. 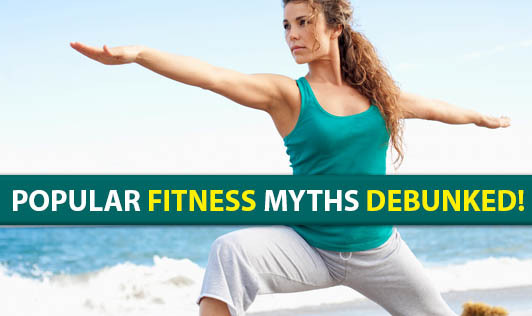 Myth 6: Fat can be spot reduced. Fact: This is just wishful thinking. It is not practical to just tone up or shape up one part of the body. Focus on healthy eating and a good workout routine for a well-toned body. Myth 7: Morning exercise yields good results. Fact: Exercising at any time of the day yields the same results. Working out in the morning or evening should be driven by personal preference and not with the false intention of losing more weight. But one should always consider the gap between meal timings and exercise. Myth 8: If I exercise, I can eat anything. Fact: There is no doubt that exercise burns calories. Especially when you are into weight loss, you need to be very watchful about your calorie intake and calorie output. Your exercise regimen becomes more fruitful if it’s combined with the right amount of calorie intake. So let's follow a healthy fitness routine that suits our body!